Now the Morgan Library’s Austen exhibit is sadly over; and we know that some Janeites flew across the country to see it, and we have to say they were rewarded for their pains. Alert Janeite Sarah sent us a link to an article in the New York Times about museum curators that included a bit about the curator of the Austen exhibit, Clara Drummond*. Going from being a teacher to curator isn’t as great a leap as it seems. “Teaching is about engaging students by telling a good story and that’s what a good curator does, too,” said Clara Drummond, 32, who was the co-curator of “A Woman’s Wit: Jane Austen’s Life and Legacy,” which ran through Sunday at the Morgan Library and Museum in Manhattan. One of Ms. Drummond’s biggest challenges when faced with presenting Austen, her world and her letters was figuring out how to best engage the audience. “It could be deadly boring,” Ms. Drummond admitted. 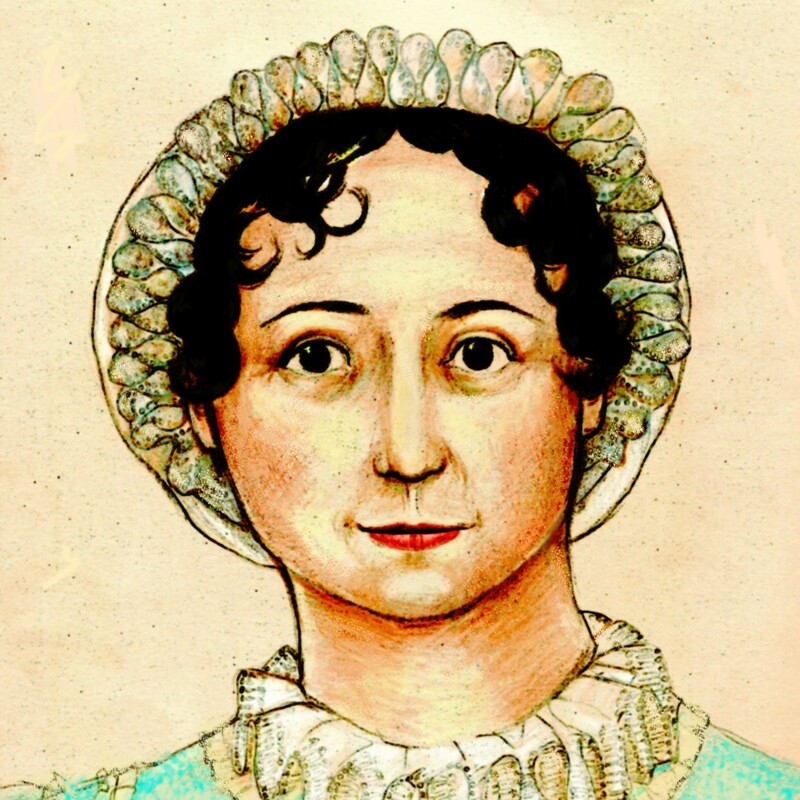 But because she saw Austen’s letters as “little puzzles” she put a lot of them in frames on the walls because, as she explained, “in glass cases you feel distanced from them.” She also paired the letters with satirical prints by artists like James Gillray and drawings by William Blake and was involved in the production of a 16-minute film with personalities like Fran Lebowitz, Cornell West and Colm Toibin talking about Austen. “We need to reach beyond the museum walls,” she said. We think she did a lovely job of presenting the letters and manuscripts and also of placing them in context. (And we think she is the Clara who commented on this post on AustenBlog!) Who else made it to the exhibition? It was definitely worth the trip from Minnesota. We saw a lot of stuff during our visit to NYC, but that exhibit is tied with the MoMA Tim Burton exhibit as the highlight of the trip. Unfortunately I could not travel to NYC to see the exhibition. But I know the answer. IIRC, a Drummond character in the novels had to be Mrs. General Tilney, who as a Miss Drummond, that would make her Henry, Eleanor and Frederick Tilney’s mother. We have a winner! 🙂 A thousand points that don’t mean anything for Cinthia! Ahhh, I’ve always thought that’s what you were referencing! I went to see it and met another wonderful JA fan there to share the experience. I took a train for three hours just for that exhibit, and then took the train right back. It was magnificent. Reading the first line of P&P in the first edition ever was incredibly cool. That was an excellent exhibit. I saw the Austen and William Blake exhibits at the Morgan on the same day, and was in heaven. I saw it twice – the first time I laughed a lot (out loud, which is jarringly obvious in a museum). The second time I hoped nobody was noticing the tears running down my face as I read Cassandra’s letter to her niece about Jane’s death. I did! In fact, I think it was literally the day or two after the post about it went up on here; I remember tweeting about it (and getting a response from you, Mags :D). My mom and I went and we both really enjoyed it. We were both getting teary reading Cassandra’s letter (apparently we weren’t the only ones!). Some of the things were so fascinating– I really liked the backwards letter. Seeing all the different editions was really wonderful, too. It really was well worth the time. My husband and I flew to New York from California just to see the exhibit. We were able to see some other sites too, but I spent almost one entire day at the exhibit because I tried to read every single letter on display as if Jane was writing to me personally. I couldn’t just glance at a letter and read the side description, and then move on. I took notes of my impressions of the letter as I read it, and even wrote down in quotes parts of the letter that I found funny or interesting, I knew that I could have later taken my notes from one of my Austen books at home, but there was something about spending time at each letter and jotting down notes as I read it. I was most moved by the letter that Cassandra wrote to Fanny describing the circumstances of Jane’s passing and Cassandra’s own feelings about it. What a beautiful letter! My husband offered me a chance to go to England this summer or to see the New York exhibit. I chose the New York exhibit because how often does one get to see so many original letters from Jane Austen in one place? I saw the exhibit also. It was amazing to see her her beautiful,even handwriting in person. I tried to imagine what it would be like to write almost daily correspondence and entire novels by hand. The prints by James Gillray added to my understanding of the cultrual context of that time. The print of the farm girl playing the piano for her family, satirizing the pretence of being in a higher class, gave me a fuller understanding of Mr. Knightley’s concern about Emma’s friendship with Harriet.